Native Dominicans are a true mixture of African, European and Indian origin. Due to this, as you may understand, we are heirs of their customs and culture, making of us real special creatures!! This heritage is present in our daily behaviour, attitude, beliefs, feelings, etc. and this is remarkable, for example, we are very noisy, the average Dominican, speak loudly, we are very outgoing, you ask a question no matter where you are to one person and you’ll have answers from all those who heard the question and feel the need to reply too!! Dominicans are always ready to celebrate whatever occasion with a party or a get together and everybody will happily cooperate with drinks, snacks, ice, music, etc.! In the Dominican Republic most people are catholics, followed by Christian evangelists and many other believers of other religions! There is also the Dominican voodoo, introduced by the African slaves, and some influence of the Taino religion! All this mix of races and religions can be observed in different religious celebrations! For example, in the rural area, when somebody dies, he will be buried in one of his favorite or best clothes, the family will hire women, who will be in charge of crying during the funeral to give the impression that the deceased was a good person! A delicious cup of hot coffee, food and soft drinks will be served to visitors, who will be talking and telling stories, of the person who has passed away, remembering of course only the good side of his life. There will be nine days of prayers in the house of the departed soul; a table with a white cloth, with pictures of some saints and flowers, is placed in a room, where family and friends will gather to pray and enjoy some snacks, coffee and beverage. This ritual is meant to help the soul leave the house where he lived forever and on the ninth day, the altar is removed from the room. This ritual is also made in towns and cities. Normally, in the cities, a funeral house is used, where families and friends will come to give their condolences to the mourners and it will be a come and go of people; a religious service will be held and thereafter the burial. But lately, in the suburbs a new way to bury the dead person, has been introduced. If the deceased was a drug dealer, lived a criminal lifestyle or died by any kind of accident, rum and beer will be served or bought, loud music of songs (merengue, bachata, Dominican reggaeton and dembow), loved by the deceased will be played and danced, the cufin will be kept open so that the dead person can be touched by the mourners, family and friends attending the funeral and maybe to have the feeling that he is participating of his farewell party!! Of course there will be crying, shouts, and other sorrow manifestations among the loud music, all of which will accompany the funeral to the cemetery. Although the Dominican Republic grows over 200 varieties of mangoes, this super delicious tropical fruit has its origin in the dry zones of India and the SE subtropical woods of Asia. This fruit is produced and consumed since 4000 years in tropical and subtropical areas in the world (Galan 1999). It is estimated that the fruit arrived in America around the XVII century via Brazil to Barbados and from there to the Dominican Republic. 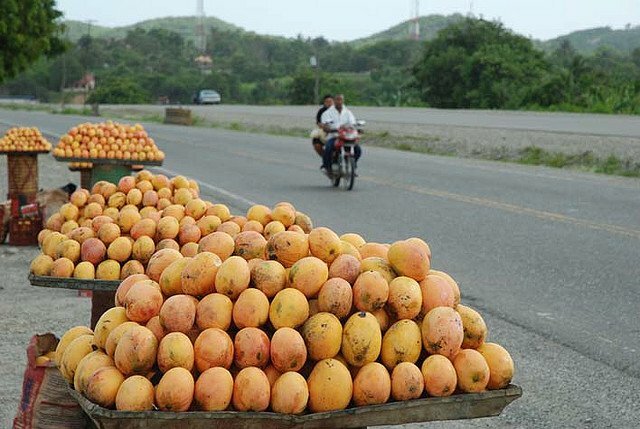 Mango is grown all over the country, but the region of Bani, in the province of Peravia, is the number one producer and has been baptized as the Mango Capital, becoming a touristic attraction, where every year the very much celebrated Mango Fair is held! It is a joyful reunion of mango lovers, producers, investors, exporters and many others who attend this fair every year. According to the mangoes exportation data, 70% are Keitt type, 15 % Tommy Atkins and the remaining 15% includes all the other varieties! May is said to be the month of the mangoes although we have mangoes growing during the whole year with concentration from April to september! 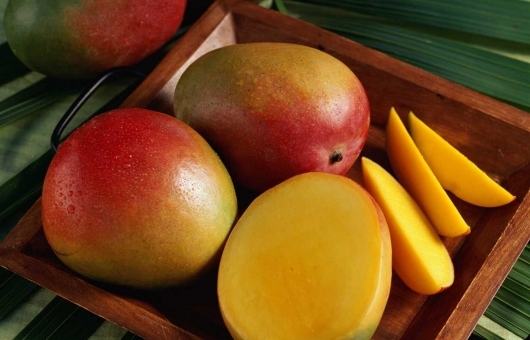 The most popular mango type is the mango “Banilejo”, which apparently has its origin in Bani! Like our typical “mangu” made of mashed plantain, our mangoes is a must try when visiting the Dominican Republic. During the popular revolution of April 1965 in the Dominican Republic, my mother and her family fled to the countryside to their property close to Bani and all around the house there were many trees full of ripe mangoes “Banilejos”. The children just sat under these trees to eat mangoes without any limit!! As you might know mangoes can become a laxative if consumed in big quantities and that happened to all these kids! Still in 1965 there was no electricity in the rural area and most of those houses had no toilets but a latrines, which was used by these kids on a non stop basis! When it was time to take a bath, it was a stroll to a nearby river!! Even though it was a difficult time, they remember it as a wonderful experience, where the mangoes were the center! Mangoes are high in Vitamin C, Vitamin B6, Potassium, Copper and Vitamin A and is one of the nutritionally rich fruit with unique flavor, fragrance, taste and thus promoting health benefits to humans. In the Dominican Republic, fruits grown locally are everywhere, you have street vendors which are standing in different places in the cities and towns during the whole year with the typical fruits Dominicans love, such as bananas, mangoes, papaya, pineapples, water melons, oranges, but to our knowledge, mangoes are the number one. The Dominican street fruit vendors have been replaced by Haitian immigrants little by little to the point that you see now more Haitian vendors than Dominicans. Since fruit shakes are very popular in the Dominican Republic, mangoes and milk shake is also among the favorite ones! Dominican mangoes are exported to many countries, included United Kingdom and guess what, it came once to our ears, that prince Charles has a preference for our sweet, delicious mangoes!!! From the earliest times, in Christianity, Holy week starts with Palm Sunday, with the celebration of the triumphal entry of Jesus into Jerusalem. The Holy week is the last week of the 40 days season of Lent and the week preceding Easter, it is the last week of Christ’s life, remembering especially His passion and resurrection. Easter is the celebration of Christ’s resurrection, the victory over sin, death and the devil, as well as, the promise of our justification and everlasting life…. In the New World, Christianity started in the Dominican Republic, introduced by the Spanish conquerors, however with the mixture of Spaniards and African slaves, some changes in costumes and beliefs occurred. Most of our ancestors were Catholics, lead by the Roman Catholic Church. Still in the sixties in the Dominican Republic, every catholic family would stay true to the religious traditions of that time to be observed during the Holy week! In that time for our catholic families, going to the beach or to the rivers during the Holy week was unthinkable, inconceivable. Nobody dared going to swim on Holy Friday, for you would turn into a mermaid or something unpredictable!! On Holy Friday, the children were ordered to stay in their bedrooms, without making any noise; food (no meat permitted) would be served in the room! The special treat would be the traditional sweet red beans! No cleaning or household job was allowed, no music could be heard but the religious or classic music! All the stores, restaurants, supermarkets, etc. were closed, everybody stayed home, watching a movie of the bible, it was like a national curfew!! But this tradition started to change with the new generations, growing population, foreign influences and the Dominicans slowly started going to the beach, to the rivers, spending the whole Holy week at a resort or just visiting families of the countryside, the main purpose is to have a good time! Nowadays, the supermarkets have special offers for the Holy Week, they make huge sales, and since schools are closed during the whole Holy Week, many families start leaving the city, traffic jams start slowing down and by Holy Thursday afternoon, it’s a completely different ambience! Those who stay in the city of Santo Domingo take it easy, with no traffic jam, they have the streets for themselves and driving becomes enjoyable. But at the end one can start thinking: Was the Holy Week established as an excuse for us to have vacation or was it to meditate on the suffering and sacrifice for humanity of the man called Jesus Christ, as appearing in the bible? “PECAO FRITO” in the Dominican Republic is a must!